PBA News 2018: The Alaska Aces won its face-off with Calvin Abueva and the Phoenix Fuel Masters, 108-97 this Wednesday at the Araneta Coliseum in the 2018 PBA Governor’s Cup. Import Mike Harris hauled 23 points, 11 boards and 3 swats, while guard Chris Banchero made 19 markers, 9 dimes and 4 caroms. ➤ Simon Enciso showed his mettle once more as he dropped 18 points and 4 assists for the Aces, while veteran Nonoy Baclao contributed 15 goals, 7 rebounds and 3 blocks. It was the best performance of Baclao as part of the Aces roster. ➤ It was a see-saw battle as Alaska overturned an 11-point deficit at the half, to lead by 12 points in the second. ➤ Eugune Phelps aided the losing Phoenix with his monstrous 27 points and 24 rebounds, while former Archer Jason Perkins chimed-in 20 buckets. ➤ “The Beast” Abueva also made a good account of himself against his former team by contributing 18 points and 9 boards. Abueva was traded recently by the Aces for Karl Dehesa. ➤ Alaska is now leading the pack in the Governors’ Cup race, as it now holds a 3-0 win-loss slate, while Phoenix buckled to its first loss for a 2-1 record. Quarters: 19-22, 54-49, 83-78, 108-97. Phoenix 97 - Phelps 27, Perkins 20, Abueva 18, Wright 13, Jazul 6, Chua 6, Intal 5, Revilla 2, Wilson 0. PBA News 2018: Alaska Aces pounced Meralco Bolts, 80-72 to register its first victory in the 2018 PBA Governors’ Cup this Friday at the MOA Arena in Pasay. Mike Harris starred for the Aces with his 23 markers and 15 boards, while returning Chris Banchero had 13 points, 6 caroms and 5 dimes. ➤ Banchero came back from a personal leave of absence (due to personal emergency) to lead the Aces anew. The Alaska franchise emerged victorious even if they traded away their star forward Calvin Abueva to the Phoenix FuelMasters. ➤ Reliable Allen Durham backstopped the Bolts with 21 points, 11 rebounds and 4 dishes, while Chris Newsome made 14 goals and 7 rebounds. 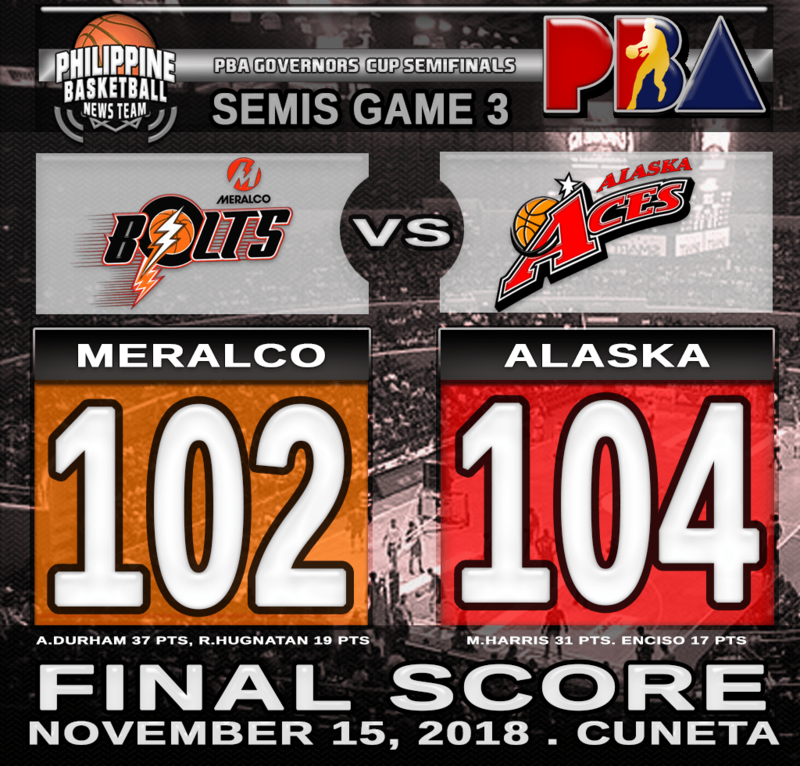 ➤ Alaska is now 1-0 in the Governors’ Cup, while Meralco fell to a regrettable 1-2 slate. PBA News 2018: Alaska Aces wrecked Magnolia Hotshots, 89-78, courtesy of another monster performance from Vic Manuel in Game 2 of their quarterfinals battle in the 2018 PBA Commissioner’s Cup this Tuesday at the Araneta Coliseum. Manuel finished with 22 points and 9 rebounds. ➤ Manuel notched a record 11 game streak of more than 20 points per game. ➤ Chris Banchero also contributed 14 buckets, 4 boards and 3 dishes for the Aces. ➤ Journeyman reinforcement Wayne Chism chipped-in 20 points and 15 caroms for the eliminated Pambansang Manok. Quarters: 26-21, 46-43, 78-62, 89-78. Manuel 22, Banchero 14, Simpson 13, Thoss 11, Racal 10, Exciminiano 7, Enciso 4, Cruz 3, Casio 2, Teng 2, Baclao 1. Chism 20, Sangalang 14, Barroca 9, Lee 8, Jalalon 8, Simon 6, Ramos 6, dela Rosa 5, Brondial 2, Herndon 2, Reavis 0, Melton 0.